Welcome to the Character Evolution Files! This monthly column focuses on character arcs, from the elements that create or enhance a character’s inner journey, to techniques that writers can employ to strengthen character arcs in their own work. Today we continue our Journey Through the Character Arc with File No. 4, which focuses on the Comfort Zone (or Act I). Once a protagonist’s character arc has been triggered, nothing can stop the impending change. That change usually doesn’t come right away, giving the protagonist time to linger in the world she knows, the life she’s grown comfortable living, and the false belief she clings to. You might already recognize this as Act I of the three-act story structure. And for our journey through the positive arc, this second stage of character evolution is ironically called the Comfort Zone. Why is it ironic, you ask? You’ll find the answer to that question as you read Character Evolution File No. 4. We’ll cover the keys to creating a Comfort Zone that flows logically from the Trigger / Inciting Incident and reflects the character’s false belief. And like last time, we’ll follow two well-known fictional characters through their separate Comfort Zones and see how they demonstrate that, even though they’re not ready to change yet, they have the potential that will make their evolution possible. Remember that you can follow along with our journey through the positive arc by referring to the Story Structure & Character Arc Alignment Chart. Click here to visit Worksheets for Writers and download the chart. Act I is roughly the first 25% of a story. Depending on the overall length, this can last between two to 10 chapters (or the first 100 pages of a 400-page book, the first 25,000 words of a 100,000-word novel, etc.). More importantly, Act I introduces readers to the character’s current world. It familiarizes us with the external (people, places, objects) and internal (desires, fears, dreams) aspects of the protagonist’s life just before the main conflict kicks off. This, at its essence, is the character’s comfort zone. If you read File No. 3 on the Trigger / Inciting Incident (Stage 1) and are wondering whether an Inciting Incident is part of Act I – you’re correct. Because of its location in the story (roughly the 10% mark), the Inciting Incident occurs during Act I. Therefore, arc-wise, the Trigger occurs during the Comfort Zone. However, because a Trigger is such a loaded event on its own, it’s appropriate to address the Trigger in a separate article, and to discuss it before the Comfort Zone because of its relevance to launching the plot. Plus, as you’ll find out, some of the development that began with the Trigger continues during the Comfort Zone. The Protagonist’s World: What kind of dwelling does the protagonist call “home”? What laws, rules, or cultural expectations have the greatest impact on her life right now? What has she been taught to believe from a religious / spiritual perspective, and from a moral / value-centric perspective? Important People in the Protagonist’s Current Life: Which characters from the protagonist’s current life should readers meet during this time? Does she have a family (parents, siblings, significant other, children)? How about friends or colleagues? Also, which story-significant characters will she meet for the first time? The Protagonist’s Current Situation: What is happening right now in the protagonist’s life? Does she go to school or have a job? What does she consider to be her normal routine? What kinds of stress (if any) does she experience from relationships, family, work, etc.? How do other outside forces (government, society, etc.) impact her life? You may also think of other questions to help you round out these elements even more. Use your imagination! Decide what you want to know about the protagonist’s current life, and make it part of the story if you can. The Comfort Zone also continues the character-building that began during the Trigger. Also, if any character details such as your protagonist’s age, physical characteristics, and positive / negative traits still need to be established, this arc stage is the best time to introduce them. That way, you’ll avoid surprising the reader later with information that should have been included earlier. In addition, the Comfort Zone is the ideal time to establish the protagonist’s false belief if the Trigger didn’t do so. (You can read more about false beliefs in File No. 3.) However, the Comfort Zone should do more than confirm the lie that the protagonist believes about herself or the world at large. It needs to show her clinging to that belief and refusing to see the opposite perspective. To accomplish this, the Comfort Zone should show the protagonist’s initial attempts to reject the Trigger’s promise of change. Think of this as an extended reaction to the previous stage. How does the protagonist feel as she grapples with the incident’s aftermath? How does this influence her thinking throughout Act I? Most important, how can you show her struggles through dialogue, action (not limited to fighting), and other story building blocks? As we discovered in File No. 3, a good Trigger should be personal to the protagonist, and should threaten her status quo and future aspirations. Therefore, the protagonist’s Comfort Zone shouldn’t feel comfortable – it should tremble with her uncertainty and reluctance. She knows her world is about to change forever, and she doesn’t want that change to come. Use the Comfort Zone to show how she rejects this knowledge and tries her hardest to maintain the life she’s used to living. At the same time, the protagonist needs to show her potential to let go of her false belief. Remember that you’re responsible for creating an arc that teaches the protagonist to evolve. But before she can, the protagonist must demonstrate that she has the capability to change. What reasons does she have for finally shedding her false belief? What qualities or traits can help her overcome it? Incorporating these factors into the story will strengthen the reader-character bond and provide insight on how the protagonist will grow and change. 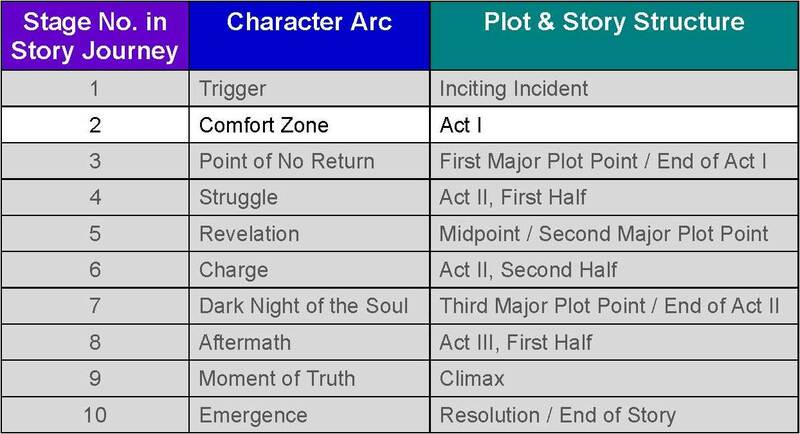 Lastly, the Comfort Zone should offer additional clues about the protagonist’s story goal. The Trigger may have already given the reader an accurate hint, but now is too soon to confirm the goal. (This will happen during the Point of No Return, the topic of the File No. 5.) Instead, think of this arc stage as a breadcrumb trail. Each scene acts as the next “crumb” that guides the protagonist toward the choice she’ll eventually have to make. If you followed the steps in File No. 3 to create an effective Trigger, your protagonist’s story goal should be tied to her false belief. So, by forcing her to adjust to the Trigger and struggle to hang on to the lie she still believes, you may have already established her goal. That being said, keep the story goal in mind as you develop the Comfort Zone. This will help you ensure that the conflict remains personal to the protagonist, and that this second stage flows logically and naturally into the next one. Want more information on the Comfort Zone / Act I? Check out these posts by K.M. Weiland on the Normal World and the First Act, or Janice Hardy’s article at Fiction University on plotting with the three-act structure. Let’s say your protagonist is a criminal on the run, and her false belief is “I can’t trust anyone.” One possible Trigger is that a law enforcement officer recognizes her in a place where she least expects to be spotted. The protagonist might react by fleeing, with the fearful knowledge that capture is imminent. She then realizes that she might not be able to escape the authorities on her own – an equally troubling idea because of her false belief. What do you notice about these suggestions? They address not only the protagonist’s false belief, but also the other Comfort Zone discussed earlier. They show us the protagonist’s life on the run (current world and situation), the people in her life, and possible antagonists. We can also assume that these scenes will reveal more about the character herself (continued development) and perhaps the crime she committed that led to her embarking on life as a fugitive in the first place. Plus, Examples #1 through #3 would be part of the protagonist’s rejection of / reaction to the Trigger’s, since they take place in the current day as opposed to the past (Examples #4 and #5). So, how could we show the protagonist’s potential for change? Maybe she craves a trusting, fulfilling relationship despite her past. Maybe she shows her capacity to give or love by performing small kindnesses for complete strangers, like a homeless man on the street or a woman rummaging through garbage to find food for her children. What other traits or qualities could also demonstrate her ability to let go of this specific false belief? Regardless, the protagonist should become desperate enough to realize she’ll need help in order to evade the police. The collision of her two fears – trusting others versus capture by law enforcement – sets the perfect stage for the choice she’ll have to make when the Point of No Return arrives at the end of Act I. All the while, her story goal (eluding law enforcement) is clear from the start, and the reasons to care about her grow in number as the Comfort Zone continues. How Does the Comfort Zone Align with Act I? Both stages occur during the first quarter (25%) of a story. Both show the protagonist’s rejection of and extended reaction to the Trigger / Inciting Incident. Important settings, secondary characters, and other (though not all) critical details are introduced during this time. Both reinforce the protagonist’s false belief as well as the opposite truth. Character development for the protagonist continues, giving readers a better idea of her strengths, flaws, desires, etc., as well as more reasons to care about her. The protagonist should show glimmers of the potential to grow and change by letting go of her false belief. Both stages continue to establish or hint at the protagonist’s eventual story goal. Don’t rush into the Point of No Return. Remember the purpose behind the phrase “comfort zone.” Your character is fighting to keep the life and the lie she’s comfortable with. Take the necessary page-time to establish her personality, her current world, and other elements discussed above. That way, your readers understand why your character doesn’t want things to change. Avoid the dreaded “info dump.” Not every detail is relevant, and readers can only tolerate so many flashbacks and explanations. Decide which supporting characters and world-building details should be included based on their overall importance to the story. Achieving this balance is tricky, but it can make all the difference between overloading readers with too much information and giving just enough to make the story world feel lived in and real while moving the plot and the character arc along. Remember that 25% is a rough estimate for the length of the Comfort Zone / Act I. It’s OK to close it around 30% or 21%, if that’s where the stage naturally ends. As long as it ends around 25%, it won’t negatively affect the story’s pacing. Anything significantly over or below that mark could result in this stage and others feeling sluggish or rushed (see Mindful Tip #1 above). 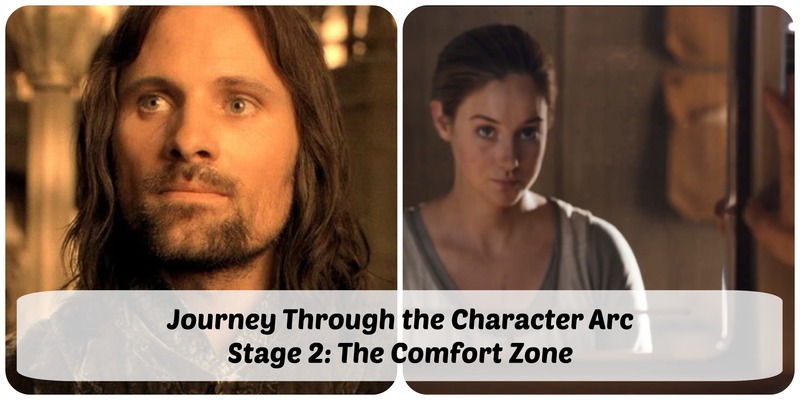 As we follow Aragorn’s journey through the positive arc, we’ll refer to the Comfort Zone basics we discussed earlier to illuminate how they play out in a story. Also, please note that these Aragorn sections will reference both the books and Peter Jackson’s film trilogy. The focus will be on film-Aragorn, who endures a more noticeable internal struggle than book-Aragorn, but the discussion will include appropriate references to the books as needed. Which brings us to one of the most pivotal scenes in the trilogy: the Council of Elrond, where the peoples of Middle-Earth decide to destroy The One Ring and create the Fellowship of the Ring. This signals the end of Act I plot-wise, but not the end of Aragorn’s Comfort Zone. Watch Aragorn carefully in both clips. Even though he volunteers to aid Frodo, he waits until the wizard Gandalf has done so first. He also hesitates to reveal his true identity in front of the Council (and in “The Sword That Was Broken” scene), and remains reticent on the subject even after Legolas confirms it. Based on this evidence, we can assume that Aragorn is content to let Gandalf lead the Fellowship. It also begs the question: What will force Aragorn to assume leadership of this quest? We’ll discover that when we discuss the Point of No Return / End of Act I (Stage 3). Timing: Aragorn’s Comfort Zone runs until Page 371 of The Fellowship of the Ring* (31% of the book trilogy) and to the 2 hour 9 minute mark in the Fellowship movie (23% of the film trilogy). Aragorn’s World: As a ranger, Aragorn has grown used to life in the wild. This is seen in his ease of traveling on foot, his navigation skills, and his knowledge of herbal healing (see “Arwen Undomiel” above). He also seems right at home in Rivendell, since he knows its residents well and speaks Elvish. Important People in Aragorn’s Current Life: During this stage, we meet Lord Elrond, who raised Aragorn and serves as a mentor / father figure; and Arwen, whom Aragorn loves. Chapter 10 of The Fellowship of the Ring* also confirms that Aragorn and Gandalf already knew each other. All three characters will continue to play significant roles in the trilogy and in Aragorn’s evolution. Aragorn’s Current Situation: As Legolas puts it, Aragorn is “no mere ranger.” He’s a descendant of Isildur, the last King of Gondor; and he’s not proud of his lineage because of its ties to The One Ring. As a result, Aragorn has kept a low profile, preferring not to draw attention to himself. Possible Antagonists: Sauron and the One Ring, obviously. There’s also the wizard Saruman, who was previously discovered during Fellowship to have allied with Sauron. However, the clips above also give us reason to believe that Aragorn might be his own worst enemy. Continued Character Introduction: In addition to what we learned about Aragorn from his Trigger, the Comfort Zone shows us that he’s resourceful (knowledge of herbs and where they grow), intelligent (fluency in Elvish), and honorable (proving his trustworthiness to the Hobbits). We also see some of his flaws. He’s responsible to a fault (struggling to let Arwen take responsibility for Frodo) and plagued by self-doubt. Confirmation of False Belief: The “Sword That Was Broken” scene confirms Aragorn’s false belief that he can’t right the wrongs of his ancestors and be a good leader. Reaction to / Rejection of the Trigger: Aragorn’s arc deviates from the typical Trigger rejection. Instead of leaving the Hobbits to fend for themselves, he assumed responsibility for their safety and volunteered to guide them to Rivendell. So, in a way, Aragorn accepted his Trigger. However, Frodo’s wounding on Weathertop shakes Aragorn’s confidence in his leadership abilities, thus causing Aragorn to question himself in later scenes. Potential for Change: Qualities such as courage, justice, honor, and responsibility – all of which we’ve discussed either in #6 above or in File No. 3 – can serve Aragorn well on his way to letting go of his false belief. More Story Goal Hints: The Council of Elrond scene does more than hint at Aragorn’s story goal. It confirms that he must help Frodo destroy The One Ring, and possibly reclaim the throne of Gondor in the process. More Reasons to Care: This last key is more subjective than the others. However, now that we’ve witnessed Aragorn’s loyalty to Frodo and learned what frightens him, it’s hard not to cheer for and sympathize with Aragorn. Tris’ comfort zone in Divergent is relatively short, lasting only until Page 47, or the end of Chapter 5 (timing = 9.6% through the book**). However, a lot happens during those chapters. We learn that the society where Tris lives is split into five factions, with Tris currently part of Abnegation (world). 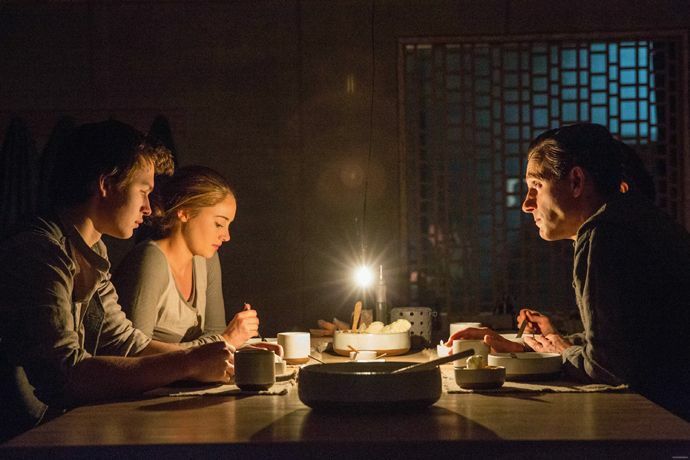 We’re introduced to Tris’ brother Caleb and their parents (important people) and to some of Abnegation’s customs (e.g., rotating household chores, modest behavior and attire, respect for one’s elders). In addition, Tris’s current situation as a 16-year-old about to choose her future faction is mirrored by Caleb, who also took the faction aptitude test that day and is preparing to make his own choice about his future, and reinforced through her internal dilemma. How does this internal dilemma manifest itself? For starters, Tris worries constantly about her Divergent results and seesaws between choosing Abnegation or Dauntless. It’s not a rejection of her Trigger; she knows she can’t avoid the upcoming Choosing Ceremony. However, her indecisiveness makes it clear that her false belief (“I don’t belong here” / “I am weak”) still has a strong hold on her. Tris’s discomfort also show through her thoughts and reflections on her time in Abnegation. She admires her birth faction’s values of generosity, propriety, and selflessness, but admits that she struggles to live up to them personally. She also points out how her parents have forced her to suppress her tendencies for sarcasm and curiosity, since Abnegation doesn’t consider those traits appropriate. Despite their differences, however, Tris loves her family and knows they’ll view her transferring to another faction as a betrayal – and she’s not sure she’s willing to risk losing their favor. All of the above allows the reader to get to know Tris more (continued development) and offers plenty of reasons to care about her. It also reminds us of her story goal (finding her place in society) and provides the necessary insight into Tris’s potential for change. The only obvious antagonist right now is Tris herself; her ability to achieve her goal will depend on her willingness to do what she thinks is right for her. If she can’t be fully herself in Abnegation, perhaps she’ll find that opportunity elsewhere – but it will all come down to what Tris decides at the Choosing Ceremony. What Questions Should You Ask to Establish the Most Appropriate Comfort Zone for Your Protagonist? How long does the character’s comfort zone last in terms of the story’s overall page and word count? What is the protagonist’s current world like? What does this world consist of (“home,” possessions, governing laws / rules / expectations, beliefs / morals / values, etc.)? Why does she feel comfortable here? What would force her to leave this place against her will? Who are currently the important people in the protagonist’s life? What role(s) will they play during the story? Will the protagonist meet new characters who will also be significant to the plot and/or the protagonist’s character arc? What is the protagonist’s current situation? What does she consider her normal routine? What relationships or outside forces put stress on her or affect her in some way? How will these play into the story? Who or what is the story’s antagonist(s)? Is it a character, an organization, the environment, or the protagonist herself? How will it / they try to prevent the protagonist from reaching her eventual story goal? What else will readers learn about the protagonist during this stage? What other positive (qualities, strengths, talents) and negative (flaws, weaknesses) are revealed? Does the Comfort Zone establish the protagonist’s false belief? How? How does the Comfort Zone show the protagonist’s continued reaction to and rejection of the Trigger? What examples of dialogue, action, and other storytelling elements prove this? What qualities or traits demonstrate the protagonist’s potential to let go of her false belief? How do they manifest during this stage? Does the Comfort Zone continue to hint at the upcoming story goal? What reason(s) have you given readers to continue bonding with and caring about your protagonist? Why should they care about her Comfort Zone struggles? What are some memorable Comfort Zones / First Acts from books you’ve read? If you’re working on a story, how would you describe your character’s comfort zone? How does he/she struggle to recover from the Trigger / Inciting Incident and grapple with his/her false belief before the Point of No Return / End of Act I arrives? Also, please join me again in December for File No. 5, where we’ll discuss the Point of No Return, otherwise known as the end of Act I. Great blog! It was literally so thorough! Great thoughts and examples. I will definitely be coming back to this and referencing it as needed. Thank you! This is a really cool break down! And I very much approve of the Aragorn usage for the example. 😉 In Subsapien, part of Bryce’s comfort zone is not affiliating with norms (humans). He distrusts them in every way because of his history with them, but his situation forces him to be around them a lot and act like he likes it. That’s an interesting example for a Comfort Zone. Would I be correct in guessing that Bryce’s Act I might end with him having to reluctantly associate with or put his trust in a human? Hinting at the story’s goal, leaving a breadcrumb trail as you said, and giving readers a reason to care, are two things I’m continuing to work on in my writing. I was just thinking, what would you consider Harry Potter’s “comfort zone” to be? If anything his “house/world he lives” in at the beginning is a horrible place he wants to escape. Harry Potter… It’s tough to say, mostly because he has an entire series worth of evolution in front of him when we first meet him. I’d have to revisit those books to see whether he has individual growth stages for each one, or whether he has one single journey that stretches out over all seven books. But yes, I do think the Dursley’s is part of his “comfort zone,” but in a different way than one would think. Harry grew up ignorant of his wizard heritage and feeling lower than the dirt beneath his aunt’s, uncle’s, and cousin’s feet. Once he enters Hogwarts, he steps into an environment that’s dramatic and conflict-ridden in its own way, but one that’s also supportive and loving. By leaving his Comfort Zone, he proves that he believes he’s worthy of something better than what he grew up with. Again, it’s different from Aragorn’s, Tris’s, and the on-the-run criminal example. But for Harry, it works. What do you think? Thanks, Alex! At least if you found Aragorn’s helpful, that’s fine. I’m using him and Tris as examples just to show that character arcs really are a broadly used technique in literature, not just a “fluke” that pops up in one story. 😉 And I’m so glad that you’re finding this series helpful for your own writing! Thank you for this article. I’ve been struggling with this portion of my own novel. Your examples really helped me. I was afraid that my character’s struggle wasn’t tough enough and now I’m thinking I might need to make her doubts more obvious. I don’t want her to seem to eager, because though she wants adventure she’s thinks she isn’t good enough. You’re welcome, Molly! It sounds like you’ve got the right idea for adjusting your character’s arc. And even though she’s seeking change or adventure, it’s realistic for her to have some doubts or fears about what’s ahead.